It was revealed in July 2007 that the Special Boat Service (SBS) were to take delivery of a so-called 'stealth boat'. Not much has been since been publically revealed about this vessel, although it has been spotted numerous times in waters off Poole, home of the SBS. The vessel was manufactured by VT Halmatic, which is now part of BAE Systems Maritime. VT Halmatic, based in Portsmouth, also manufactured the VSV 16, one of the two power boats replaced by the new stealth model (the other being the Italian-made FB MIL-50P). The BAE Systems Maritime website refers to the product line as the 'Fast Interceptor Craft' (FIC). As with the VSV and MIL-500, this new boat's role will be that of insertion and interception. The Fast Interceptor Craft lives up to his name with a rumored top speed of 60 knots (70mph). The boat has been designed to have a low radar and thermal signature. To help achieve this goal, the FIC features an angled design and a distinct lack of external fittings. The radar dome, communications antennae and other apertures are shrouded to minimise the boat's radar cross-section. The boat is known to feature panels that cover the boat's aft section. With the panels opened, a ramp at the stern can be used to launch and recover an inflatable boat such as the Inflatable Raiding Craft (IRC). Precise details of the propulsion systems, construction materials, sensors or communications systems fitted on the SBS FICs remain classified at this time. A military-spec radar, FLIR sensor and secure UHF/VHF/SATCOMM fit is, however, very likely. The size of the SBS's fleet of stealth boats is also not publically known, although at least 2 have been spotted together in public. The Fast Interceptor Craft is piloted by Special Forces Boat Operators (SFBOs) with the Maritime Maneuver Squadron. 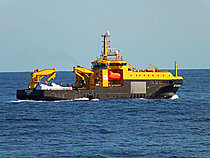 The Fast Interceptor Craft can be transported and deployed worldwide by the SBS support ship, SD Victoria (see photo, bottom of page). Special trailers can be used to transport the FIC by RAF C-130J, C-17 and, eventually, A400M cargo planes.